Parents often dread the teenage years of their children, while teenagers cherish them as the time of "coming of age". "I'm grown up now and I can do anything that I want to"- is the common attitude amongst teenagers. Suddenly, in a waking moment, your teenager begins to think that they know more than you do and they say things like "you dress like an old person", they refuse you to do their chores, and they even resent your authority. Advices you give them are thrown out of the window since they want to make all the decisions on their own terms. First of all, parents often fail to reason their teenager's behaviour. It's important to keep in mind that this is the time when teenagers are trying to establish their own identity, purpose and direction in their lives. 1.Do show respect for your teenager: Show it and you will receive it in return. You need to respect their privacy by expressing an interest in their personal lives, without trying to invade their privacy such as logging into their Facebook account, or looking through their phone. Let your children know that your opinions and feelings matter to you and don't forget to be constructive in your explanation, if you don't agree with them. Praise them if they have done something good and admit and apologise when you have been wrong. 2.Do listen: "Nobody in this world understands me". Sounds familiar? A very common adage of adolescence. Parents need to empathize by being a good listener. Listening will show that you care and also help to develop a sense of mutual trust. Further. It will give you a better understanding of situations without jumping to conclusions. 3.Do let them know you're there: You are self-assured that you will be there for them, but do they? Creae an open environment wherein all family members can feel free to discuss about anything without the fear of being judged. 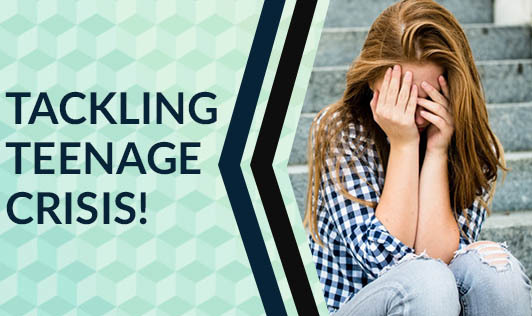 Give your teen a chance to learn from his or her own mistakes. 4.Do have fun together: Here we're talking about quality over quantity. It can be as simple as watching a film together or going out for a meal. 5.Do keep consistent and calm: A teenager's behaviour can be unpredictable. Try to keep your calm at most times, as this will help them to do the same and eventually encourage level headed communication. If you happen to say anything out of anger to them, clear the storm by explaining why you were upset and apologise for the same. 6.Don't nag: When parents feel frustrated, they always end up nagging. The bottom line is that at any age, we all resent a nagger. Don't focus on the bad. Instead, try to be more positive by offering encouragement. If your children are watching television when they should be doing home-work, instead of shouting at them to stop watching television, suggest recording the programmes, so that they can be watched once they finish with their school work. 7.Don't preach: Avoid using patronising language, such as "When I was your age ....." this will only create chaos. Instead, make the advice you give sound relevant to them. Resist any assumption that you "know best". 8.Don't shout: Aggression is likely to be counter-productive; it can only push your children away further or make them display aggressive behaviour. 9.Don't take things personally: Teens, usually with their hormones running riot, end up saying things at the heat of the moment. Remember, this is the time when they are exploring and teens usually have to let it out a couple of times to learn how to control their emotions and express them more constructively. 10. Don't try to change them: Every teenager is a unique individual. During this confusing period of self-discovery, accept your daughter or son the way they are rather than overlooking their strengths and paying attention to their temper, or being ashamed of them. •Practice loving and consistent discipline early. •Continue to set limits, but gradually work towards reasonable responsibility and decision. •Work on being approachable, flexible and understanding. •Seek and provide adequate substitutes for banned activities and practices. Don't continuously prohibit without providing an alternative. •Never, under any circumstance, withhold acceptance, forgiveness or encouragement. •Understand teenage attitude and respond with humorous attitude and facts, it helps! "Remember that it is love, understanding and support that teenagers want, and this teenage attitude is a phase, with some tough love, it too will pass"